This bag is made of a nylon material. Keep all your jewelry in one place and in an easy to carry case. For a woman on the go, worrying about having all your favorite jewelry should not be a chore. Check out the image with a 20 dollar bill for perspective of size of the case (bill not included). 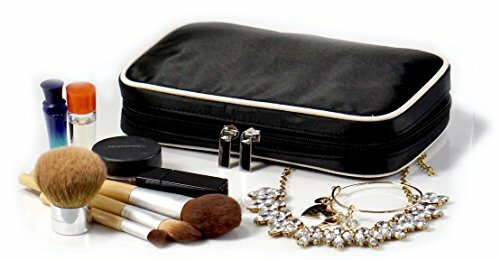 For less chunkier pieces, please check out our "Simple Accessories 8" x 11" Hanging Travel Jewelry & Accessories Organizer Roll Bag with Zippered Compartments"
Designed and shipped from the USA and Imported. Manufacturer is certified by ISO (International Organization of Standardization) according to ISO 9001 standards.